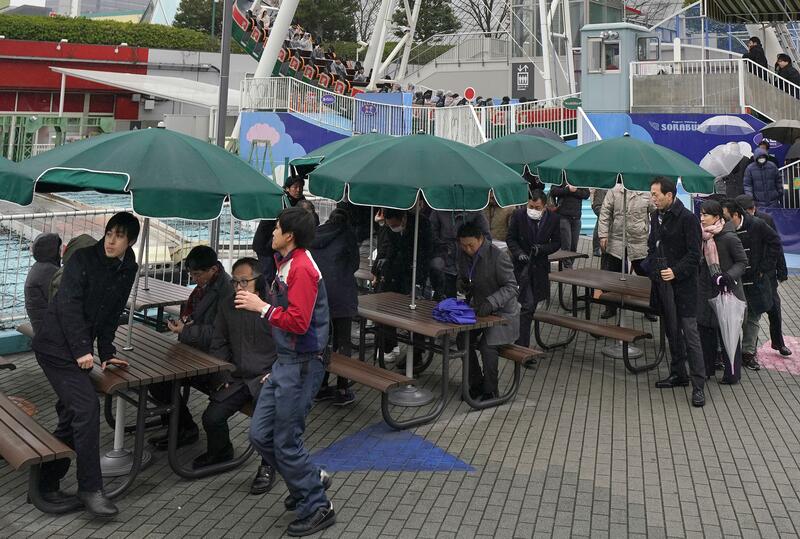 TOKYO – People huddled into an amusement park basement and a subway station in Japan’s capital and others ducked and covered their heads at a community center Monday during a drill based on the scenario of an incoming North Korean missile. Loudspeakers in Tokyo’s first such drill warned that the activities involved a scenario of a missile attack and urged people to shelter indoors or go underground. The amusement park operators immediately stopped the rides. Some of the 200 employees who were pretending to be park visitors left picnic tables and rides and calmly marched to a basement. More than 20 evacuation drills have been conducted around Japan since last year amid threats from North Korea, but Monday’s activity was the first missile evacuation drill in Tokyo. North Korea has sent ballistic missiles flying over northern Japan at least twice. The North also test-launched intercontinental ballistic missiles in lofted trajectories that fell inside Japanese exclusive economic waters off the northern coasts, saying it accomplished goal of having weapons that could target the U.S. mainland. Those launches caused no damage but raised concerns about Japan’s response. Japan’s Prime Minister Shinzo Abe fully backs U.S. President Donald Trump’s policy of keeping all options on the table and has pledged to bolster Japan’s missile defense capabilities and caution levels. Monday’s drill comes a week after Japanese public broadcaster NHK issued an erroneous alert about an incoming North Korean missile. The mistaken alert came days after emergency authorities in Hawaii sent an erroneous warning of a missile attack to mobile phones across the state, triggering a panic. Pacifist activists protested outside each of the venues participating in Monday’s drill. “If Japan really seeks peace, the government should make more diplomatic effort instead of telling us to be prepared for an attack,” she added. Published: Jan. 22, 2018, 7:51 a.m.